The committee meeting was followed by a presentation by Planning Policy Officer, Steve Johnson, speaking on the subject of "Planning in Relation to Marple Development". See report below for details. A well attended and lively speaker meeting held on 29th July heard Planning Policy Officer, Steve Johnson, speak on the subject of "Planning in Relation to Marple Development". Steve described changes in planning law over recent years, the stage that Stockport MBC are at in implementing the new legislation - the Local Development Framework (LDF) - and how Neighbourhood Plans could be applied in Marple. He explained that the LDF borough strategy document - the Core Strategy - had been implemented but the LDF local plans have not been implemented. The implementation of the Allocations DPD (the local plan for Marple under the new LDF legislation) is at least 12-18 months away. There was keen interest amongst those present to learn more about Neighbourhood Plans particularly in the absence of a local Marple plan to guide the many challenges that face Marple centre. Steve confirmed that in the absence of an LDF local plan, the Unitary Development Plan from the old planning system is used and also the national strategy planning document - the National Planning Policy Framework (NPPF). Neither are sensitive to Marple's current needs in planning terms. Deep concern was expressed amongst those present regarding the traffic scheme associated with the Chadwick Street car park. Steve confirmed that planning consent is in place and the traffic scheme could be implemented at any time. It was noted that the agenda for the next Area Committee meeting on Wednesday 6th August 2014 contains an item (item number 8) listed as "Neighbourhood Action Plans". We can confirm that this is not connected with Neighbourhood Plans as discussed at the meeting. 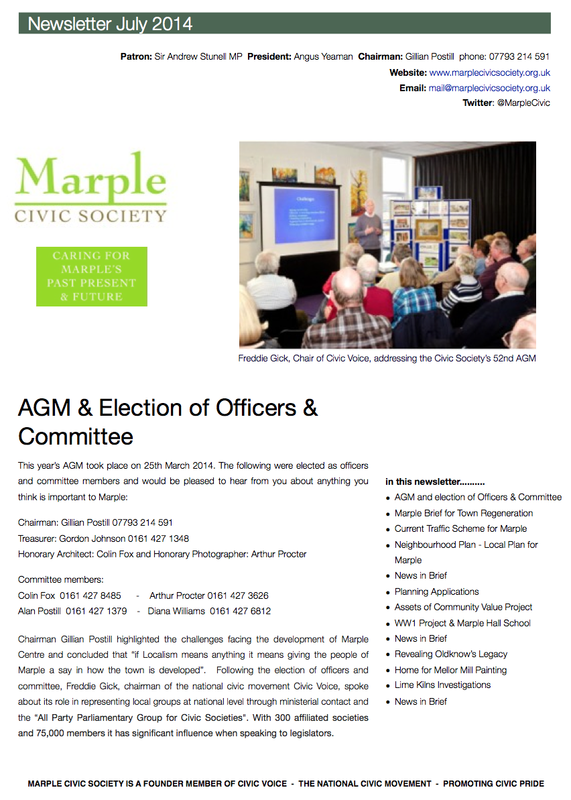 The society's next speaker meeting will take place on Tuesday 29th July from 4pm - 5pm in Marple Library. A Planning Officer from the Stockport MBC Planning Policy Department is the speaker who will talk about planning and how it relates to Marple. This is a pertinent subject given the many challenges that face Marple: ASDA taking over the Co-op store, a potential Chadwick Street development with a new traffic scheme, a substantial housing development planned for the Hibbert Lane College site, the possibility of residential use in Goyt Mill and a planning application due for the Marple Wharf site. But what do we have in our planning armoury to guide these multiple planning decisions? Do we have a 5 year housing allocation? 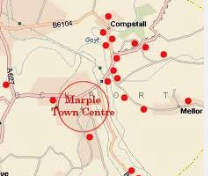 What plans are in place to ensure a positive regeneration scheme for Marple centre and do we have an up to date local plan that is sensitive to Marple's current needs? Here is an opportunity to hear what the Planning Policy Officer has to say about these and other issues relating to Marple, and to have the opportunity to ask questions and voice your views. Do join us if you can at 3.40pm for light refreshments before the meeting starts at 4.00pm - 5.00pm on Tuesday 29th July in Marple Library - a lift is available. This is an open meeting and all members of the public are welcome so bring your family, friends and neighbours - there is no charge for this meeting. The society's July 2014 Newsletter is now available. Windlehurst Park is the first successful listing of an Asset of Community Value in the Marple Area. 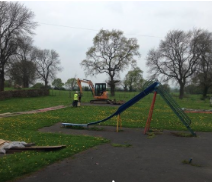 Friends of Windlehurst Park, who made the nomination, are a relatively new group set up as a result of park equipment being removed from the park by Stockport MBC. This is the first of many nominations suggested by local groups and Marple residents. The Civic Society is co-ordinating a community project which will see up to 36 nominations submitted to Stockport MBC for listing. We are working with the council to coordinate the submission of nominations with the aim of all listings being made before the end of 2014. Congratulations to Friends of Windlehurst Park for successfully listing Windlehurst Park as an Asset of Community Value. Although it was announced last year that the £1.5m bid for HLF funding for the Revealing Oldknow's Legacy had been successful, the start date has been delayed because of contractual issues dealing with the lease on the land at the Mellor Mill site. However, the formalities are now complete and permission given to start the project. Very soon the project officer, Fiona Turpin, will be officially in post and we can expect to see the start of community activity by September of this year. "After making so many discoveries and developing so many ideas in our prolonged development phase it is very exciting to at last be on the verge of beginning to deliver this project which will celebrate Samuel Oldknow, a significant figure of the early textile industry. The project will offer a glimpse of the industrial revolution in the North West of England and its effect upon the region and nation's social, economic and political history: from mechanisation and how people earned their living to international trade and war. 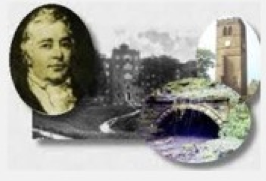 The stories will be brought to life in Mellor and Marple's picturesque landscape setting using the Aqueduct, Canal, Lime Kilns and Mill sites in particular to show how it was modelled to accommodate the activities of the day and how Oldknow's legacy still very much exists. The project will offer many avenues for everyone to get involved, learn skills or have fun whilst gaining an understanding of our shared heritage and learning more about the area's history and the next three years looks set to create some great activity in the area and leave its own mark for visitors and locals alike for some time after that". Due to the delay in the start of the project a community archaeological dig at the Lime Kilns is unlikely to take place this year. Nontheless, work has commenced with vegetation being removed earlier in the year and survey work carried out funded by English Heritage (EH). This important structure is on the EH 'Heritage at Risk' register and after many years of little work or maintenance the Lime Kilns are now getting the attention they deserve. A topographic survey and geophysical survey have been carried out which will provide a greater understanding of the site and inform a programme of community activity. The survey findings and results will be presented at the Civic Society Social Evening on Thursday 9th October this year. Prime Minister David Cameron has revealed details of a £5 million fund to protect war memorials. Civic Voice will receive half a million pounds to create a national network of volunteers to help build skills to assess the condition of war memorials and encourage their conservation. The Civic Society are currently working with Marple Hall School on a project to commemorate WW1. It was planned to bid for HLF fundings for the project but in view of the opportunities created by this initiative we have decided to align our project with the activities announced by the fund partners. We will publish details of our proposals over the next few months but they will include workshops, talks/ presentations and displays of artefacts and documents.